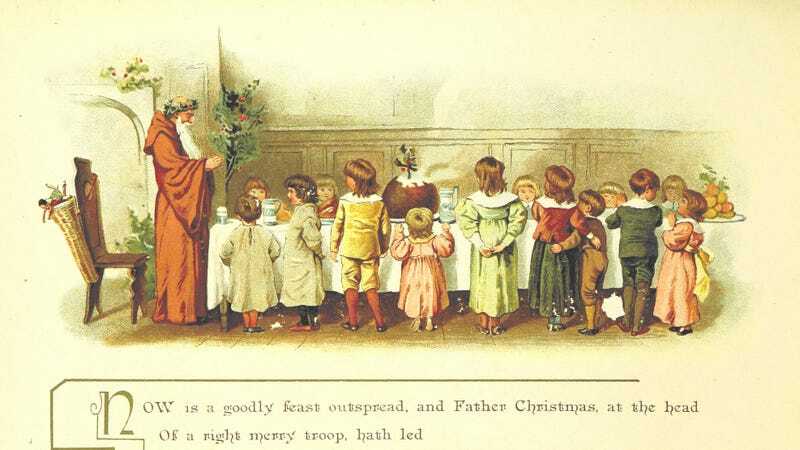 From “The Coming of Father Christmas,” via the British Library’s incredible Flickr account. Archeologists say they may have discovered the tomb of Saint Nicholas, a.k.a. Santa Claus, a.k.a. Father Christmas, a.k.a. Kris Kringle, underneath a church in Antalya, Turkey. So—a real good news, bad news situation. Ho ho ho! Surveys have uncovered an intact temple and burial grounds below St Nicholas church in the province of Antalya, where the saint is believed to have been born, archaeologists told the Turkish newspaper Hurriyet. The town of Demre, where the church is located, already does a brisk tourist trade thanks to St. Nicholas Church and its connection to the historical figure who inspired the modern Santa Claus, but previously the theory was that his actual body had been smuggled away to Italy, to what’s now the St. Nicholas Basilica, but archeologists say that was actually some priest and think the real deal might remain on the premises. “We believe this shrine has not been damaged at all, but it is quite difficult to get to it as there are mosaics on the floor,” the head of Antalya’s Monument Authority Cemil Karabayram told the Daily Sabah. Can’t wait to see Megyn Kelly cover this!